mama elephant | design blog: Surprise Post from Kathy Racoosin + GIVEAWAY! Surprise Post from Kathy Racoosin + GIVEAWAY! We have the wonderful and always delightful Kathy Racoosin here today with us sharing two cards along with a video with some of the new ME products released just yesterday! Kathy from The Daily Marker loves to color & she is hosting a 30 day coloring challenge. The idea is to color everyday even if it’s only for ten minutes a day. Yesterday marked the middle of the 30 day challenge. If you haven’t taken the leap yet you still can join in the challenge. Carving out a little time for you each day will bring you more joy than you realize. Go here to read more about the 30 Day Coloring Challenge and if you want to share what your creating go to Day 1 and scroll to the bottom of the post. You will find a blue Inlinkz tab to link up your coloring. We are so happy to support our friend and this awesomely fun challenge! Kathy is giving away the full set of our newest stamp sets Chance of Rain and Sunday Stroll along with their coordinating dies on her blog at www.thedailymarker.com! Please visit her blog for coloring tips and tricks and leave her tons of ME love! Love the new sets and Kathy's cards thanks for the chance to win you are so sweet. July 4th is usually when our rains begin here in the desert. This sweet set would make some great cards for monsoons! These sets are so cute! I love Kathy's cards and videos, I'm off to check out this video. The stamps are darling. they're small enough that you can practice coloring without having to cover a lot of space. thanks for letting us know about the giveaway. Thanks so much for being part of the 30-day challenge...these stamps are just too cute!! Off to Kathy's! These kids are so cute!! The " weather the storm together" is my favorite card! Love that little rain bear! The cards are so cute. The second one is my favorite. This is the cutest release. 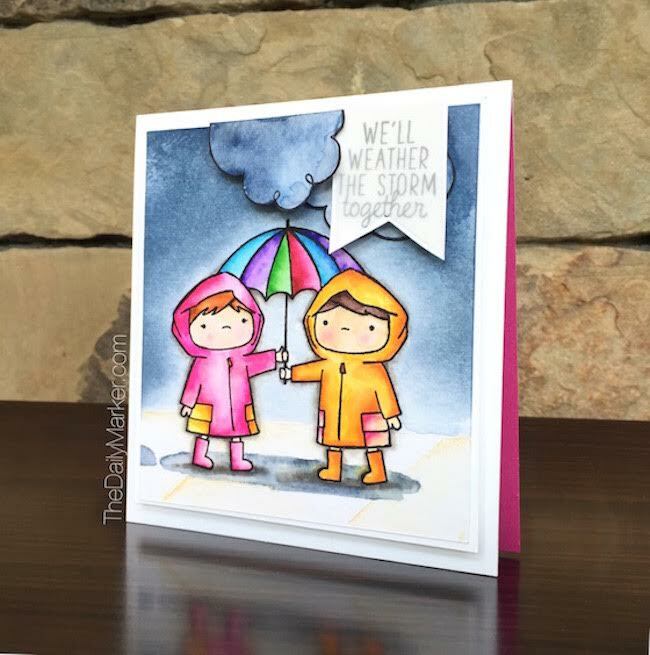 We'll Weather the storm together is the cutest card. I spoke to me and made me smilr. Thanks Mama Elephant for the gifts! The scenes that can be created with these sets are endless!! Love them! Adorable stamp sets, Kathy colored with them wonderfully and made awesome cards. That is very sweet of you to offer this give away! Keep up the good work! I'm so excited for these stamps sets! Too stinkin' cute! Thank you for the giveaway! Kathy did such a cute job on her cards. Those little kids are so cute and I love all the picks of different animals that can follow the kids around (or be chased). Thanks for the chance to win this set. These stamps are fabulous! Thanks for the super giveaway! thanks for sharing all your steps and thought process during creating. It is always nice to see that creating is not so planned, and I am not the only one who changes things during the process. I really love the look of the weathering the storm card. And what great coloring Kathy does! Thank you for sharing about the 30 day challenge and the awesome wicked giveaway! Thank you for giving these stamp sets away. I love these, well, all of your stamps look fun, and these that Kathy has colored are just adorable! Wow! Three adorable cards for different occasions. I especially like the weathering storm card because of the sentiment and the fabulous storm clouds! Love these sweet cards. Thank you for giving such a great prize. The new set is amazing, thank you! these cards are so great, and I'm loving her 30 day challenge. I think my LSS just got these stamps, woo hoo! thanks for the great prize offer!!! Awesome coloring! These cards are adorable! I love both of these cards! Don't make me choose one! You are an amazing artist! Thanks for the wonderful giveaway! And thanks for the great videos that you share! 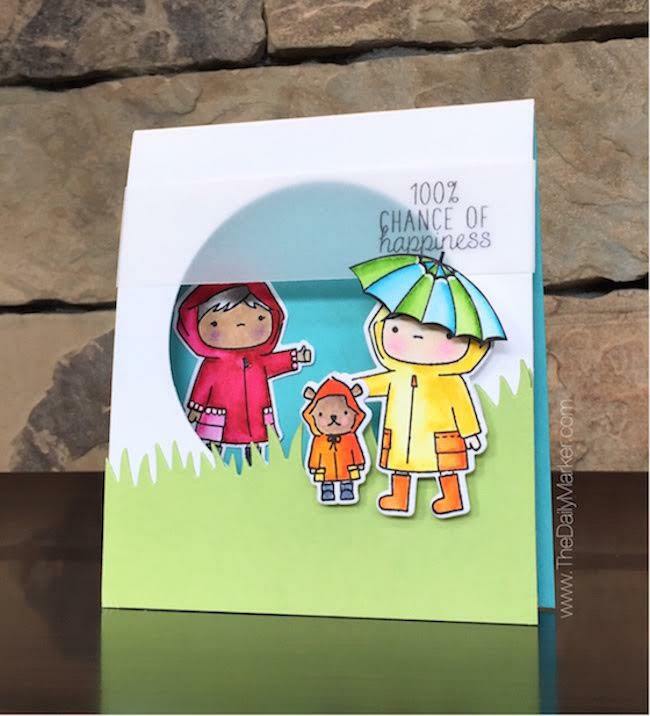 popped here after seeing these two adorable cards on kathy's 30 day colouring challenge blog; thanks for the chance to win! Kathy does a great job on both cards and you guys did a great job on a wonderful new release, as always!! Thanks for supporting the 30 day marker challenge and offering up the great prize!! Both cards are adorable! I love that you are willing to try new things. Thanks for sharing! I love this stamp set and these cards are adorable! Super cute release!! Love the coloring!! Kathy does the best cards and videos!! Cute and colorful cards! I love this stamp set! Very cute! Love card #1, but both are very good. Thanks! I love the simplicity of the designs and yet the expressiveness of the coloring. All of mama elephant cards are amazing and beautiful. This one does not disappoint! Thank you for inspiring us to want to create a better and more creative card. Thank you so much for sponsoring Kathy. This challenge is so much fun and she is always so inspiring! These sets are so adorable! Love the cards!!! Thank you SOOOOOO much for supporting the 30 day challenge. I have been having a blast, especially when using ME stamps (my favorites so far as Just Hatched and Up & Away -- loooooove those little critters!) Thanks for the giveaway! Sweet cards. Love the coloring and detail. What a great set to win! The latest ME release is super adorable. So glad Kathy decided to use this set, her cards are so cute! Wonderful card! Thanks for sponsoring the giveaway over there! Kathy is such a sweet and talented artist. She really made your new stamps shine. I enjoy the whimsical feel of many of your stamps. Thanks. The stamps are really cute, and Kathy's colouring is impeccable!! Thanks for the generous giveaway! What great cards! Thanks for the great giveaway! Wow! Thanks SO MUCH for sponsoring the giveaway!! Thank you so much for supporting Kathy's challenge...it's so generous of you! Thanks so much for providing such an amazing prize pack to Kathy! LOVE these new stamps and dies even more than before - Kathy did an amazing job with them!!! Wow... that is some give away! Kathy's video is awesome and absolutely love this Mama Elephant Release. Look forward to watching the color challenge each day too or reading about it on Kathy's blog. Love that she is doing this again. Coloring is therapeutic! Love this card! Thanks so much for sharing! I love the new release! Thanks for the amazing giveaway on Kathy's blog! I love the rain set. My favorite card was the first one! Also, love all the tutorials and tips you have to share, thanks! This card is so sweet! Love the new release. Thanks for the chance to win. Thanks for sponsoring Kathy with these cute sets. Kathy is such an inspiration. Love all things Mama Elephant! Love this darling set. I thank you for giving us all a chance to win. Love, love, love this new set! Thanks so much for the chance to win!! This new set is super cute! Love this sweet set and the amazing coloring from Kathy! Such a cute rain scene card! A great video showing all the steps involved. Love the sky. Beautiful cards, and love the release, so cute! Thank you for the chance to win! Rainbows on rainy cards, I love it! Cute sets! Thank you for the chance to win on Kathy's blog! Great job Kathy! Great release Mama Elephant! Kathy is amazing and I always love her work! And Mama Elephant, you have done it again with another fantastic release! Thank you for the giveaway! Adorable stamps and dies! Love this card too! Thanks for sharing Kathy's info. I've been following her for a bit now, and am really enjoying what she shows. These stamp sets are sooo darn cute! The cards are perfect for children and even adults. The coloring is fantastic. Thanks for sharing and at a chance to win these sets. I look forward to more fabulous card tutorials. Kathy's cards are always so vibrant and amazing and this one is no exception! What an adorable stamp set! Wow awesome cards great coloring and those stampsets are so, so adorable. TFS. Love the new sets. Kathy's cards are stunning. I love the new sets and Kathy has a wonderful style. Thanks so much for the giveaway and support! Love the new sets. I'd love to win a set. The little kids walking is so precious. What cute children and you colored them so well. the stormy sky and water puddle were great. thanks for the tips. So cute!! I love that umbrella hat Kathy! Oh, your cards are amazing! Gorgeous coloring and such bright colors! I'm so in love with those little ones in their raincoats!! Love these rainy day cards. The coloring is wonderful!